This two day 'Fair Trek' adventure with great landscapes and interaction with local rural village life. The trek follows the slopes and hills of a huge mountain range along trails used by the locals and passes along Khamu and Hmong villages. Get to meet the local people and even stay overnight in one of the small family home-stays. 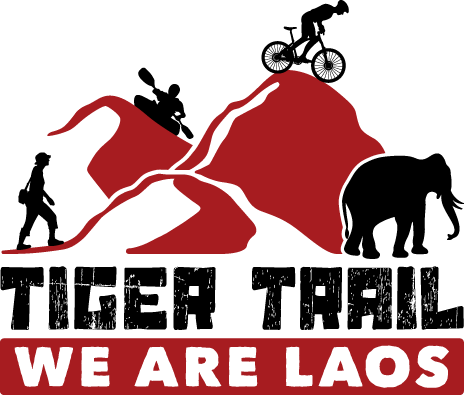 You will get an introduction to Lao Loum, Lao Theung, and Lao Sung people and culture. Share life and get to know the real Lao countryside. As you walk through this area you help the communities through your contributions. The tour also includes a visit to the Tad Sae waterfalls (seasonal). Longhut trail is one of the most spectacular trails in the area, situated in the foothills of steep jungle-covered mountain on one side and a spectacular view over Luang Prabang and the Mekong River on the other side. This tour begins with a 30-minute drive to our Tiger Trail Adventure camp on the banks of the Nam Khan River to cross by boat and begin ascent into the mountains. The trail is an invigorating and sometimes technical hike taking you through canyons to remote villages and small lakes. The full day hike spans 13 Km, normally taking 6 hrs with breaks included. Under wet conditions, the hiking can be 7-8 hours and is rated at medium to difficult, and always well worth the challenging hike. You’ll arrive at the Khmu village late evening for an authentic cultural homestay and a well-earned meal prepared by your guide. Enjoy exploring the village with your guide, have a drink with the locals if you like, and otherwise enjoy this incredible night deep in the mountains living for a night as the mountain tribes have for ages before. Enjoy breakfast and set out for 1.5- to 2-hour trek through the rice fields and forest then making your way up the hillside to a Hmong village "Ban Tinpha", a wonderful place where you will enjoy the panoramic view of the surrounding mountains. Afterwards, we continue the trek downhill to a village along the river "Ban Houay Yen" where we board a local boat for a relaxing ride on the Nam Khan to the Tad Sae waterfalls (seasonal). Lunch will either be served at the village before the boat ride or at the waterfall whichever you prefer. If you want to cool off after all the trekking you can swim in the pools at the base of the falls or relax in the shade. Before heading back to the town of Luang Prabang you will take the local boat to our Tiger Trail Adventure Camp and then drive back to the town. Note: Tad Sae Waterfall can be low or even dry approximately February to July and may be omitted. Transportation to trek start point 8:30 a.m.